The astounding success and immense utility of earlier National Conclaves on Mines & Minerals to gather solidarity in approach for addressing the issues in the mining sector, the Ministry of Mines is organizing 3rdNational Conclave on Mines & Minerals on 20th March 2018 in Convention Hall, Hotel Ashoka New Delhi. Federation of Indian Mineral Industries(FIMI) has agreed to partner in the event. The PSUs which are closely associated with the mining activity directly or as an integral part of their production process, would be one of the major stakeholders assisting the Ministry in organising the conclave. These PSUs are NALCO, HCL&MECL under the Ministry of Mines and the companies in which the government stake is under the administrative control of the Ministry of Mines, viz. HZL&BALCO. Hon’ble Minister of Mines, Shri Narendra Singh Tomar has consented to give the awards for ‘5 Star’ rating in the conclave to the 20 best performing mines which are star rated. The Star rating system evaluates performance of mines on technical, socio-economic, environmental parameters; final and progressive mine closure and adoption of international standards with the objective to bring standardisation in mining operations and for minimising impacts of mining. The extension of implementation of the Star Rating System for minor mineral mines for will be discussed in the conclave. The existing 14500 users of the registration and the returns module will be migrated into the new system. The daily returns may be filed from the Mobile App or directly on the online portal. The filing of monthly returns will have to be done on the new system starting this months return onwards. The MTS software has to be integrated not only with the existing IT systems of the States, but several other existing IT applications viz. Aadhar, RTO data, GST, etc., for its effective implementation. The registration and handing over of folder and badges would be done at the venue itself from 9.00 onwards on 20th March 2018. Prime Minister Narendra Modi has said, the government has received tremendous support in its efforts to curb black money and fight corruption. He was speaking at the Rising India Summit organised by a private TV channel in New Delhi last evening. Mr Modi said, due to the support and inspiration of the people, the government has succeeded in taking and executing bold steps. He said, there is a transformational shift in the country because of the people and their will to dream. The Prime Minister said, in his opinion, Rising India means rising the confidence of 125 crore people of the country. He said, Rising India evokes the thought of light through the darkness. Mr Modi also envisaged the role of northeast towards Rising India. The Prime Minister also said, Swachh Bharat Mission has now become people’s movement. He also highlighted the Ujjwala scheme which has changed the lives of crores of people. Mr Modi reiterated the government’s commitment to make health care affordable and accessible to all. He said, in this year’s budget, the government announced the Ayushman Bharat Scheme under which wellness centres will be set-up and a medical insurance coverage of 5 lakh rupees will be provided to 10 crore families. The Prime Minister asserted that the government has planned to invest one lakh crore rupees to improve the education system in the country. Mr Modi said, India is performing well on all macroeconomic factors. He said, the power sector is undergoing several transformational changes to fight power shortage, adding that 16,000 crore rupees are being spent on electrification projects. The Prime Minister also said, the government has given nearly 5 lakh crore rupees loans to the poor without guarantee. Mr Modi said, India is spearheading a solar revolution in the world, adding that in the last 4 years, India has contributed massively to the world economy. He said, the motto of Sabka Saath, Sabka Vikas is not just restricted to India but covers the world. The Prime Minister also said, India helped 48 countries during the crisis in Yemen. Mr Modi said, Rising India means the rising of pride of over 1.25 billion Indians. He said, isolation to integration is the only way to Rising India. The Prime Minister said, the government is working at a fast pace on its resolve to ‘Act Fast for the North East’. He said, the government is ensuring that the projects pending for long are completed so that people and the states facing the imbalance with regard to development are benefited. Punjab, a Patiala court has awarded a two-year prison sentence to singer Daler Mehndi for human trafficking. The court found him and his brother guilty of taking ten people to the United States 20 years ago as part of their singing troupe, in return for money. The case began in 2003. Mehndi’s lawyer said, the singer was granted bail immediately after the sentencing by the court. 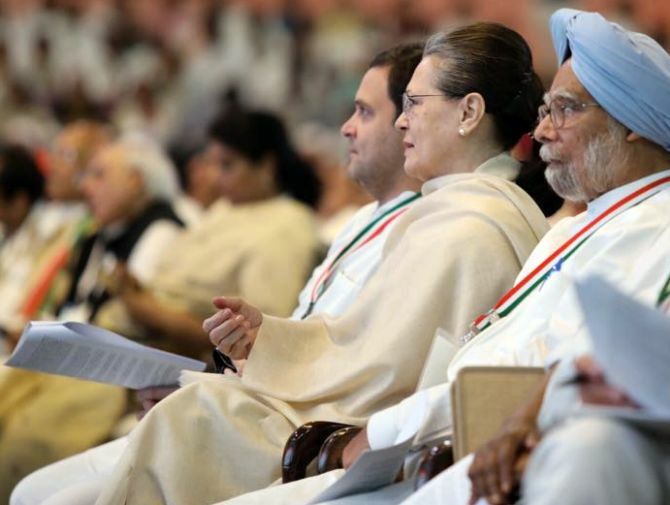 Congress President Rahul Gandhi, former party president Sonia Gandhi and former prime minister Manmohan Singh attended the 84th Congress plenary session in New Delhi, March 17, 2018. Congress on Saturday, March 18, resolved to adopt a ‘pragmatic approach’ for cooperation with all like-minded parties and evolve a common workable programme to defeat the BJP-RSS in the 2019 general election. Congress launched an attack on the BJP-RSS, saying the country’s core Constitutional values are under attack and freedom of all is in jeopardy, with institutions under stress and their independence compromised. Congress President Rahul Gandhi, in his inaugural address at the 84th Congress plenary session. He accused the Narendra D Modi government of spreading hatred and anger, and said the Congress was the only party that would take the country forward by fostering an environment of amity and love. Gandhi said the Congress’s hand (its election symbol) is the only one that would unite India and take it forward, and reminded partymen that it followed the ideology of love. Further added, difference between two was that while they spread anger and hatred, “we spread love and brotherhood”, we would take seniors and the youth together as the tradition of the Congress party was to embrace change without forgetting its past and legacy. “If the youth have to take the Congress forward, it cannot be done without the experience of the party veterans. My task is to be take them together,” he said. President Gandhi said that crores of youth in the country, looking up to Modi, are not finding any anything as there were no jobs. “The country is tired of what is happening under the current government. Only the Congress party can show the way and heal divisions in the nation,” he said. “Come what may, this country belongs to everyone, every religion, every caste and every person and the Congress party is for everyone and we will not leave anyone behind,” he added. The party also gave a clarion call to its rank and file to rise to the occasion and defend the foundational values of the Republic and Constitutional democracy. The resolution said at a time when the country stood at the crossroads, facing the threat posed by ‘authoritarian, divisive and disruptive forces’, the Congress is committed to serve the people of India with its illustrious history and legacy that represent multi-cultural, multi-lingual and multi-religious India. Under the BJP regime, the Congress said, the people of the country, be it farmers, labourers, unorganised sector workers, self-employed, Dalits, traders, minorities and the poor have been ‘betrayed’. The political resolution called for reverting to the old practice of paper ballot as adopted by other major democracies to help restore the credibility of the electoral process. ‘It will have serious implications, which must be thoroughly enquired into, and a national consensus built,’ it said. ‘The Congress condemns the BJP government for brazen abuse of power and misuse of central agencies for targeted political vendetta to harass, humiliate and persecute its political opponents,’ the resolution stated. ‘The Congress party warns the BJP and its government that its undemocratic methods and acts to curtail liberty, freedom of expression and violation of fundamental rights of its citizens as enshrined in the Constitution will be strongly resisted,’ the resolution added. The party also said the judicial system needed urgent reforms for effective and timely dispensation of justice and said the huge pendency of cases and providing affordable justice remains a big challenge that needs to be addressed. The resolution also called upon the media to restore the balance in national narrative to safeguard democracy. 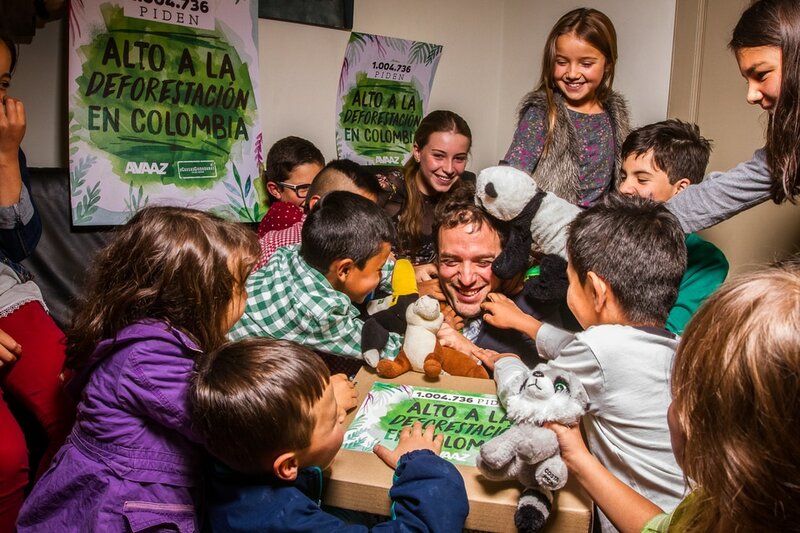 Colombian Deputy Minister receives Avaaz petition delivery last week We may have won our campaign to stop Colombia’s massive deforestation! The team and members brought a million-strong petition (and several cute kids) to a key minister this week, and got 42 election candidates signed on to our 5-point forest pledge! After satellite pictures we obtained showed massive deforestation in Colombia, the President flew over the land we were campaigning for, and it looks like we’re going to win! Here’s an update (in Spanish) from Ana Sofia. 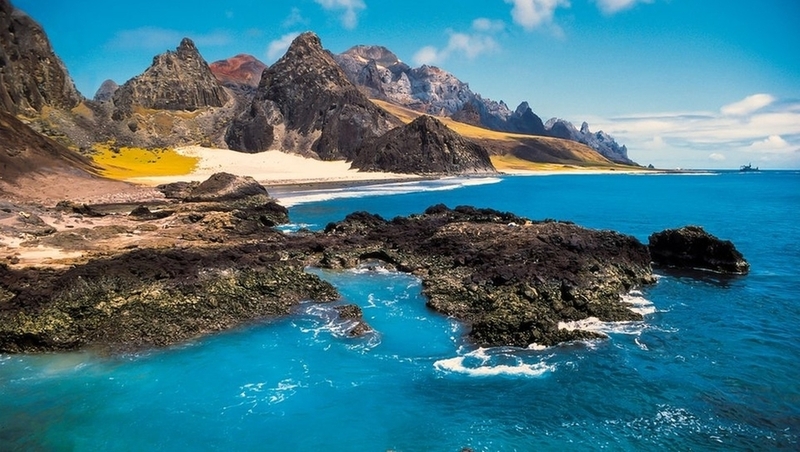 Who wouldn’t want to protect this?We might help win the largest ocean reserve in the Atlantic! 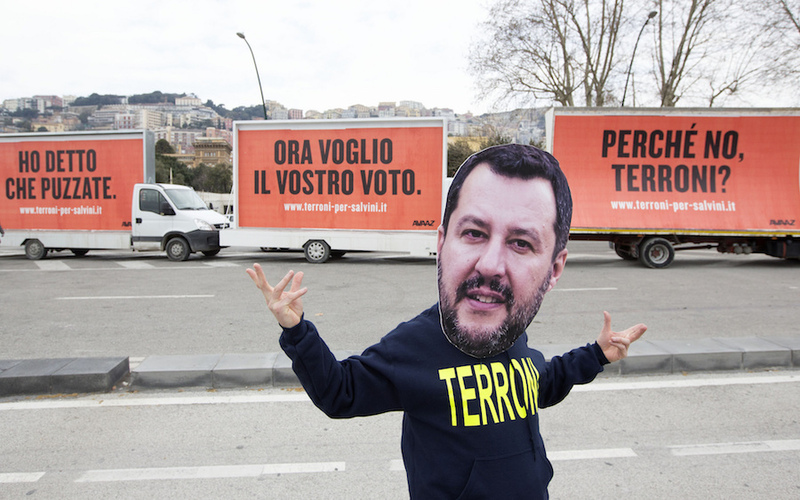 Our fake far-right leader on his fake tour of southern Italy got over 100 media hits!We worked our hearts out to stop a far-right win in Italy! With a fascist-led coalition close to winning the election on Sunday, we were flat-out for a month — reaching millions of voters in close races over email, on Facebook, and in the media, asking them to cooperate across a splintered opposition, and vote for the candidate most likely to defeat the far-right. Our polling showed our impact, and Avaaz was constantly attacked in the right-wing press (e.g. here and here) and our Senior Campaigner Luca got threatening phone calls. The election largely turned on the South, so last week we also staged a hilarious fake tour of the South by the far-right leader — who once said Southerners smelled worse than dogs — that generated over 100 media articles! Examples here, here and here, and here’s an update from Luca (in Italian). The media likes to hype the fascists, but the result was a clean sweep of the south and the far-right coalition is FAR short of the majority we feared! We tried to get Monsanto’s lawyers to listen to reason when their subpoena demanded every record we had that mentioned them, but they told us to get lost! So with the donations of 135,000 members last month, we hired top-notch lawyers to file an official challenge. Last week, Monsanto’s attorneys agreed NOT to seek members’ private data. That’s HUGE! But we’ve still got to defeat the rest of their awful subpoena. 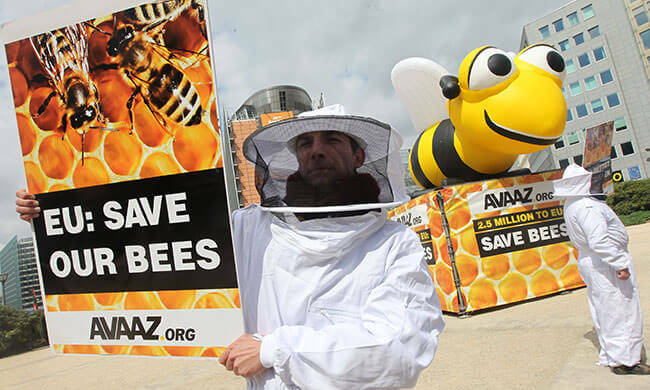 Monsanto and Bayer are trying to merge into a megacorporation, and Avaaz is the only civil society group that received official “third party” status in the EU regulator’s process. Our team and lawyers we hired (after members donated for it!) have been filing complicated briefs and meeting with regulators — the signs are not good that we can win this, but we’re pushing hard! Watch the update from Nick here. 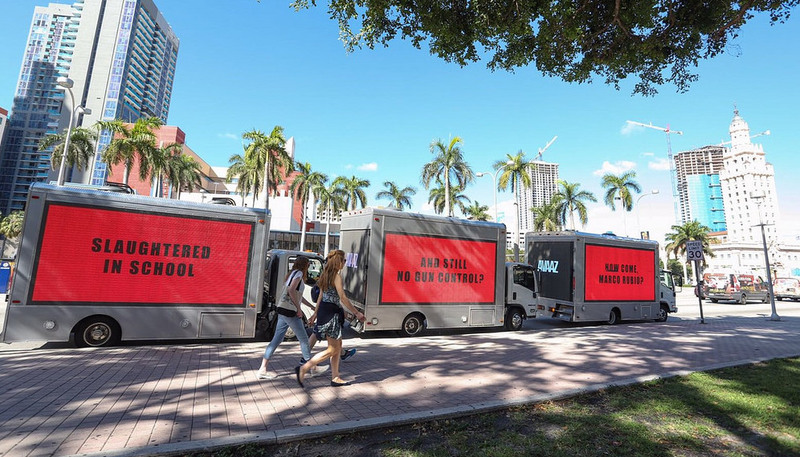 After the awful school shooting, the Avaaz team, led by Emma, Nell and Dalia, mobilised in 24 hours to point the finger at top gun-lobby money recipient Senator Marco Rubio. Playing off the famous movie, we ran 3 billboards outside his office and he was forced to respond to them! The billboards got a crazy amount of media attention across the US and the world — e.g. CNN, Washington Post, Huff Post, Libération, Il Post. Now we’re planning another massive demo for next week, with thousands of shoes on the front lawn of the Capitol building, representing kids killed by guns. Here’s a video update from Dalia. African leaders about to sign our petition to ban ivory! Bert and Sarah are deep in planning right now for an Avaaz-led session at a big summit next week where African leaders, led by Botswana — home to more elephants than anywhere else — will sign our petition to the EU to ban ivory! This is huge because the EU claimed African leaders didn’t want them to do it! Now they’re out of excuses :). See a video update from Bert here. Ivory “antiques” we bought last week for testing…And we’re getting ivory tested in a lab! 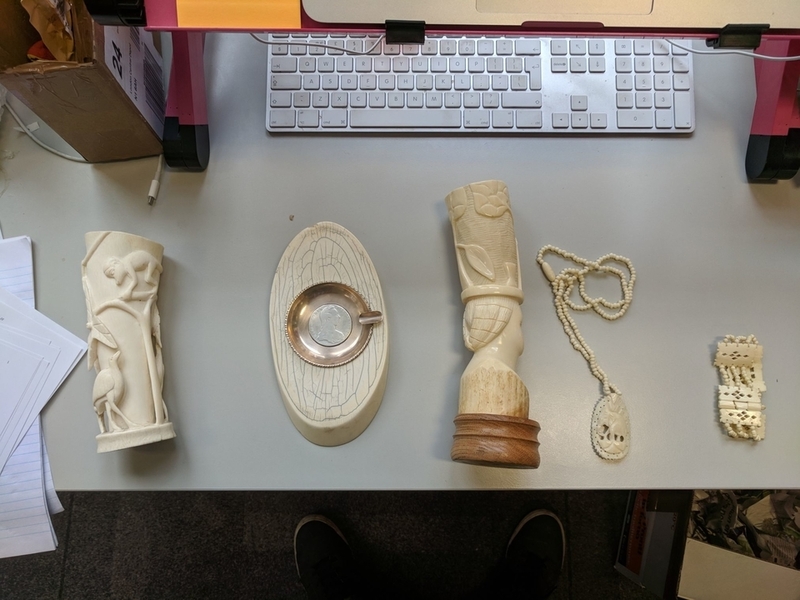 We received another shipment of ivory “antiques” last week, paid for by Avaazer donations, that we’re sending on to be tested at Oxford University. If we can prove that they’re not in fact antique but from recently killed elephants, we’ll really knock down all Europe’s excuses and press them to join the rest of the world in banning all ivory! A huge step in the race to save elephants from extinction. Check out our latest acquisitions with Spyro here. We’re in the final mile to win a permanent ban on bee-killing poisons in Europe! Antonia is talking to EU politicians and scientists in Germany, Belgium and the UK to organise a briefing for decision-makers, and over the weekend Dutch Avaazers pressured their government to fall in line with this viral campaign. We’re also getting a new study underway. The final vote could be as soon as March 22nd! Video update from Antonia here. Nick’s been in meetings for weeks getting ready to help launch an awesome left-right coalition in the US against the war in Yemen! It launched a bill last week that could lead to the first time in 50 years that Congress stopped the President waging a war! 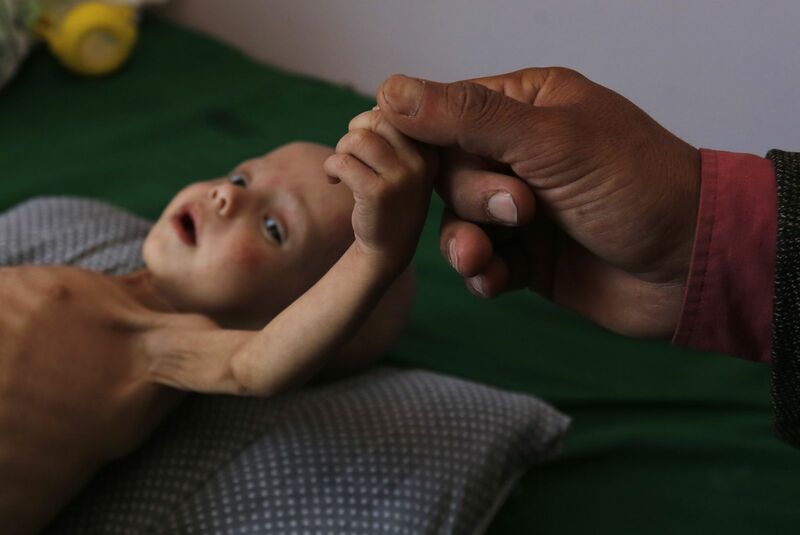 We’re flying witnesses in, and hosting a photo exhibit from Yemen for Senators this week. Our video with children from Yemen has over 6 million views! And in London, we’ll greet the Saudi crown prince this week with a massive die-in. Video update from Nick here. Fadi had to drive through tear gas to meet Ahed Tamimi’s family…(Photo by Oren Ziv/Activestills.org)We’re fiercely advocating on behalf of Ahed Tamimi and Palestinian children in detentionLast week Fadi drove through clouds of tear gas to sit in Ahed’s living room and plan a children’s march with her family, after 9 more children in the village were arrested. Then he persuaded the minister of education to support the march! We’ve also recruited 38 famous lawyers and judges to sign an open letter to Roni Numa, the Israeli military commander. 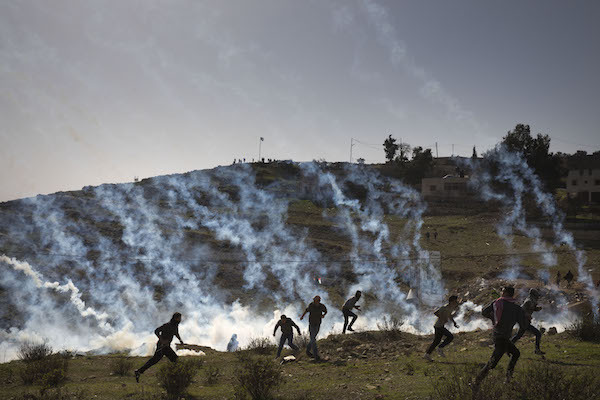 And our donations continue to support Ahed’s and other Palestinians’ legal defense. See a video update from Fadi here. The evidence is mounting that Trump is as dirty as they come, especially relying on laundered or corrupt funds to bail out failing businesses. US investigators are pursuing, but Trump’s corrupt empire is global, so Alex, Alaphia and Meetali are investigating his dealings in 9 countries and advocating with authorities to follow suit. Last week we flew an expert to meet with prosecutors in a key country (they don’t want to be named yet) who are close to launching a probe! 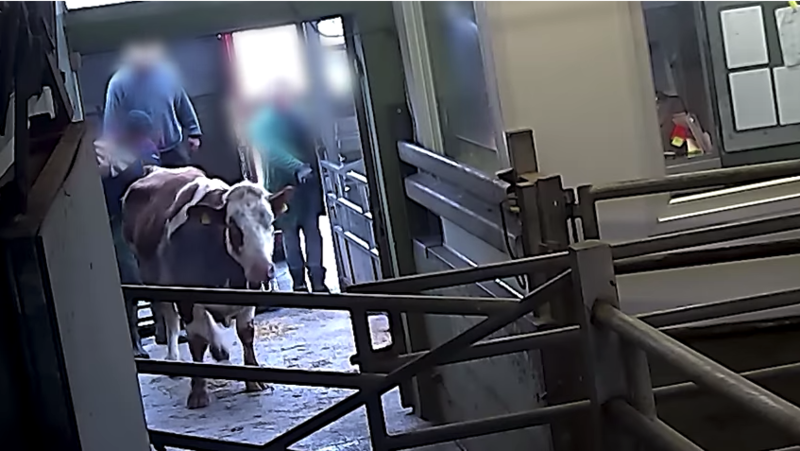 A still image from a video we funded to expose and shut down a slaughterhouse.We’re gunning to shut down more slaughterhouses! The undercover investigations we all funded got 2 huge slaughterhouses closed! Even McDonald’s is suing one after footage of cows writhing in pain came out (SWR, Focus). And we got another one closed and investigated in December (Süddeutsche Zeitung, BusinessInsider). We’ve been talking with the investigations teams last week to scope who’s next! Check out Antonia’s update here. We attended a major strategy meeting of hundreds of top environmentalists in London this week. Alice was asked to speak in the final plenary, and helped inspire the group on the bold new vision and goal of protecting half the earth for nature. She schemed with allies and strategised key scientific studies to fund and ministers to persuade (we’ve already met ministers and officials in Paris, London, Bogota and Brasilia). And we got results yesterday from a poll we ran showing 2/3rds of the UK public support this vision! Watch an update from Alice here. Last week Rewan and Allison did their best to launch campaigns on the carnage on Syria, with one focusing on an unprecedented vote of the UN General Assembly, and another on threatening Russia’s World Cup, but our community didn’t love them enough to get the green light. If Avaaz members don’t LOVE a campaign, it doesn’t happen, and because the standard is so high, about half the time our campaigns don’t make the cut! E.g. Another campaign that failed last week was an open letter to the CEO of Monsanto. We’ll keep trying! Diego, Laura and Ricken had meetings with officials with both the French and Brazilian governments who are drafting laws to deal with the massive threat to democracy posed by fake news and disinformation campaigns, which 85% of Avaazers are concerned about. We shared results of polling Avaaz members on solutions, and sent them memos on the solutions most popular with Avaazers that both fix the problem and avoid government overreach. You can read our Brazilian memo here. 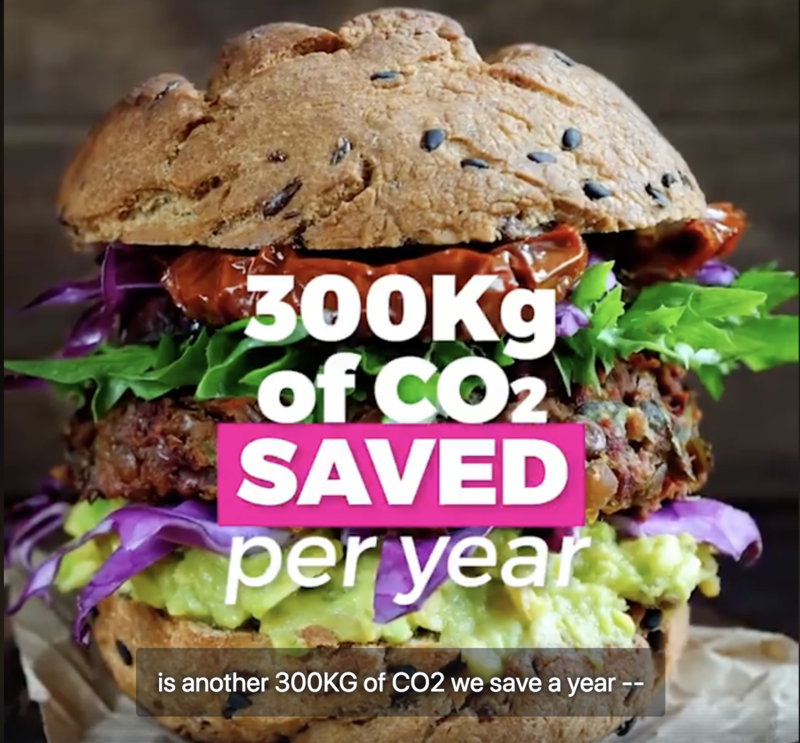 Lisa emailed the 530,000 Avaazers who signed our “Eat less meat” pledge with next steps. 94% are keeping their promise! European Parliament members circulated our Monsanto email to 189 MEPs! They invited Avaaz to come speak to them about this and other issues like fake news. Nana went to the Brazilian congress to interview women leaders and make a video for our campaign encouraging more women to run for office in elections this year. Christoph and René continued our campaign to help get a strong platform and coalition for the new German government, including targeted advertising and messages from members. Alex and others are intensively lobbying MPs in the UK Parliament on an amendment to require a vote on the next Brexit deal, and also aiming for a second referendum. And seriously, that’s a pretty normal week. It’s a shame that Avaaz members can only see a tiny sliver of all this. But please know that the team is incredibly grateful for this ridiculously wonderful movement — ALL of this is thanks to ALL of us — Thank You!!!!! !